The cornea is the transparent dome at the front of the eye through which the iris (the coloured part of the eye) and the pupil (the black hole in the centre of the eye) can be seen. The cornea is responsible for most of the focusing power of the eye. It has to be clear, smooth and regular for individuals to see clearly. If the cornea is deformed, damaged or hazy/scarred, sight will be impaired. Why do people have corneal grafts? The usual reason for performing a corneal graft (transplant) is to enable patients to see more clearly. Occasionally the operation may be advised to help reduce chronic eye pain or to save the eye if there is an ulcer or trauma which has perforated (ruptured) or is threatening to perforate the cornea. What is a corneal graft and where does the new cornea come from? 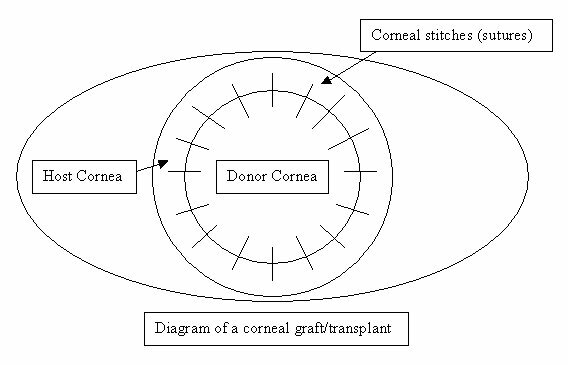 A corneal graft or transplant is an operation in which part, or all, the cornea is removed and replaced with healthy corneal tissue from an individual who has died and donated their cornea for transplantation. Permission has always been obtained from the deceased prior to death or from his/her family. Without the generosity of these corneal donors it would be impossible to perform transplant operations and give the gift of sight to hundreds of people each year. Prior to transplanting the donor's cornea, it will have undergone a number of tests to make sure it is suitable and healthy. The cornea is normally stored in an Eye Bank for a short period before being sent to the hospital where the operation is performed. As well as ensuring the health of the cornea to be transplanted is good, a number of checks and blood tests are also performed to ensure that the recipient patient will not catch any form of infection (such as HIV/AIDS and Hepatitis C) from the new cornea. This operation is normally performed under a general anaesthetic although, if the patient's general health is poor, it can be performed using a local anaesthetic. Blood and other tests are sometimes performed to ensure patients are in good health for the general anaesthetic. The operation usually takes between 30 to 60 minutes. It involves the eye surgeon removing a circular portion from the centre of the cornea and replacing it with a similar sized circular area from the donor's cornea, which is then stitched into place with very fine stitches (also called sutures). The surgery is performed with the help of a microscope. In some cases other procedures such as cataract extractions and glaucoma operations may be done in combination with corneal transplant. The diseased part of the cornea that has been removed is occasionally sent to laboratory for examination under a microscope. Following the operation, some soreness in the eye may be experienced and usually the eye is padded with a plastic protective shield taped over it. This is removed 12-18 hours following the surgery. A full thickness or penetrating corneal graft involves removing the whole of the central diseased cornea. A lamellar or partial thickness graft replaces part rather than all the thickness of the cornea. If only the anterior/superficial part of the cornea is diseased and the deeper layers are healthy then only the front part of the cornea need to be removed or replaced. This is termed a deep anterior lamellar keratoplasty. It is generally more technically demanding to perform, but means that the endothelial cells (see below) are not replaced and therefore the risk of rejection is less likely and fewer steroid drops may be needed after the surgery. The eye also retains some of its structural strength and is less vulnerable to injury. If the superficial layers of the cornea are healthy but the deep layers (corneal endothelium) diseased then these can be replaced without removing the superficial layers. This is termed deep endothelial lamellar keratoplasty. The transplant requires no stitches to keep it in place, allowing a much quicker recovery and less induced astigmatism. In order to optimise patient recovery and long-term graft survival it is Professor O'Brart's choice to always perform partial thickness/lamellar techniques whenever possible. Pain is unusual after corneal graft surgery although the eye can be irritable for a number of days. The eye is typically not padded but patients are asked to wear a plastic shield over the eye at night for the first four weeks following surgery. Vision is typically blurred for the first few weeks and months after surgery as the cornea heals and settles slowly. However, an improvement in vision is often noted even during the first few days/weeks. Typically, vision is not stable during the first six months following surgery so glasses are not usually prescribed until after this time. It is very important after the surgery to use eye drops and they should not be stopped without consulting your eye surgeon. Initially these drops will have to be used very intensively i.e. every hour or every two hours, but gradually over the next weeks/months, the frequency of usage will reduce. The drops used following surgery are usually of two types: The first are antibiotics which are prescribed in order to prevent infection and are usually only used for about 2 weeks; the second are steroid preparations, which are used to reduce inflammation and the risk of corneal transplant rejection and are normally prescribed for several months. In some instances patients may be given steroid eye drops indefinitely if the risk of rejection of the transplanted cornea is high. If patients are at a high risk of corneal graft rejection steroid tablets and other immune system suppressing drugs may occasionally be advised. While taking steroid medications, it is especially important to attend all out-patient consultations as they can cause raised pressure within the eye which can permanently damage the nerve at the back of the eye and cause loss of sight. During the first weeks after surgery the cornea is vulnerable to trauma and care should be taken to avoid strenuous exercise, swimming or heavy lifting. A plastic protective shield should be taped over the eye at night/while sleeping for the first four weeks after surgery. Those with sedentary (office) jobs can go back to work, 2-3 weeks following surgery. However, with more strenuous occupations at least 4-6 weeks should elapse before returning to work. Those who play racket or minor contact sports such as football should always wear eye protection during these pastimes. Major contact sports such as rugby, boxing, martial arts should not be undertaken as an eye after corneal grafting is never as strong as a normal eye. Uncomplicated cases can expect to attend 7-8 times in the first year following corneal transplant surgery. Stitches are typically removed 1-2 years following the operation when glasses or contact lenses can be prescribed to optimise vision or if necessary other surgical procedures can be performed to reduce any focusing (refractive) problems with the eye. Minor complications occasionally occur. These include leaks of fluid between stitches which usually settle but may require the use of a bandage contact lens or extra stitches. Episodes of raised eye pressure may occur which may require the use of glaucoma eye drops. About one in seven patients who undergo a corneal graft will have an episode of rejection. Some patients are more at risk than others such as those who have blood vessels that have grown into the cornea from previous infections and inflammations, those who have had previous grafts and those with other eye diseases such as glaucoma. Most rejection episodes occur in the first year after surgery. However, it can occur at any time, even years later. If rejection occurs, it is treated with steroid eye-drops and occasionally steroid tablets or injections. These may need to be continued for many months and occasionally permanent steroid eye drops are required. In order to maintain transparency the normal cornea is maintained in a dehydrated state by a single layer of cells on the innermost surface of the cornea called the corneal endothelium. In humans, endothelial cells do not re-grow i.e what you are born with is what you get. These cells can fail with time especially if the reason for corneal grafting was due to failure of these cells in the first place, if the donated cornea had relatively few cells in the first place or the surgery was complicated causing loss of endothelial cells. Symptoms of endothelial cell failure include blurred vision especially in the morning on waking, the appearance of coloured halos seen around lights and eye irritation. These eyes often require repeat corneal grafts. This can occur if the graft was done because of a genetic disease such as a corneal dystrophy or keratoconus or infection such as herpes virus. Eye surgery and the long-term use of steroid eye drops are associated with the development of a cataract (a clouding of the lens within the eye). This may require further surgery if it becomes symptomatic. Some degree of astigmatism, where the cornea has an asymmetrical curvature, is very likely after corneal grafting. This can be corrected with glasses, but occasionally requires contact lenses if the astigmatism is of a high degree of if there is associated long or short-sight. If astigmatism is present some surgeons may adjust or remove some of the stitches during the first months after surgery. In a few cases a corneal graft can result in very severe astigmatism and if contact lenses are unable to correct this or cannot be worn a further operation to improve the shape and focusing of the cornea may be required. These procedures include peripheral cuts (astigmatic keratotomies), corneal tension sutures, Excimer laser surgery and lens extraction and insertion of toric (astigmatism correcting) intraocular lenses. Such surgeries may be necessary in about 30% of cases.